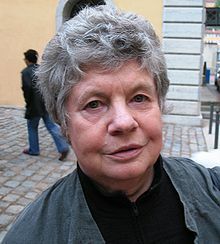 Dame Antonia Susan Duffy DBE HonFBA (née Drabble; born 24 August 1936), known professionally as A. S. Byatt (/ˈbaɪ.ət/ BY-ət), is an English novelist, poet and Booker Prize winner. In 2008, The Times newspaper named her on its list of the 50 greatest British writers since 1945. Byatt was born in Sheffield as Antonia Susan Drabble, the eldest child of John Drabble, QC, and Kathleen Bloor, a scholar of Browning. Her sisters are the novelist Margaret Drabble and the art historian Helen Langdon. Her brother Richard Drabble QC is a barrister. As a result of the bombing of Sheffield during the Second World War the family moved to York. Byatt's upbringing was fairly unhappy as she struggled against her domineering mother. She was educated at two independent boarding schools, Sheffield High School and the Quaker Mount School in York. She noted in an interview in 2009, "I am not a Quaker, of course, because I'm anti-Christian and the Quakers are a form of Christianity but their religion is wonderful – you simply sat in silence and listened to the nature of things." She did not enjoy boarding school, citing her need to be alone and her difficulty in making friends. She went on to Newnham College, Cambridge, Bryn Mawr College in the United States, and Somerville College, Oxford. Byatt lectured in the Department of Extra-Mural Studies of the University of London (1962–71), the Central School of Art and Design and from 1972 to 1983 at University College London. She married Ian Charles Rayner Byatt in 1959 and had a daughter, as well as a son who was killed in a car accident at the age of 11. The marriage was dissolved in 1969. She has two daughters with her second husband Peter John Duffy. Byatt's relationship with her sister Margaret Drabble has sometimes been strained due to the presence of autobiographical elements in both their writing. While their relationship is no longer especially close and they do not read each other's books, Drabble describes the situation as "normal sibling rivalry" and Byatt says it has been "terribly overstated by gossip columnists" and that the sisters "always have liked each other on the bottom line." The story of a young girl growing up in the shadow of a dominant father, Byatt's first novel, The Shadow of the Sun, was published in 1964. Her novel The Game (1967) charts the dynamics between two sisters, and the family theme is continued in her quartet The Virgin in the Garden (1978), Still Life (1985), Babel Tower (1996), and A Whistling Woman (2002), Still Life winning the PEN/Macmillan Silver Pen Award in 1989. Her quartet of novels is inspired by D. H. Lawrence, particularly The Rainbow and Women in Love. Describing mid-20th-century Britain, the books follow the life of Frederica Potter, a young intellectual studying at Cambridge at a time when women were heavily outnumbered by men at that university, and then tracing her journey as a divorcée with a young son making a new life in London. Byatt says some of the characters in her fiction represent her "greatest terror which is simple domesticity [...] I had this image of coming out from under and seeing the light for a bit and then being shut in a kitchen, which I think happened to women of my generation." Like Babel Tower, A Whistling Woman touches on the utopian and revolutionary dreams of the 1960s. She describes herself as "a naturally pessimistic animal": "I don't believe that human beings are basically good, so I think all utopian movements are doomed to fail, but I am interested in them." In those books and other works, Byatt alludes to, and builds upon, themes from Romantic and Victorian literature. She conceives of fantasy as an alternative to, rather than an escape from, everyday life, and it is often difficult to tell when the fantastic in her work actually represents the eruption of psychosis. "In my work", she notes "writing is always so dangerous. It's very destructive. People who write books are destroyers." Possession (1990) parallels the emerging relationship of two contemporary academics with the lives of two (fictional) nineteenth century poets whom they are researching. It won the Booker Prize in 1990 and was made into a film in 2002. Byatt's novella Morpho Eugenia, included in Angels & Insects (1992), was turned into the successful film with this same title (1995), nominated for an Academy Award. Her novel The Children's Book was shortlisted for the 2009 Man Booker Prize and won the James Tait Black Memorial Prize. She has written critical studies of Dame Iris Murdoch, who was a friend, mentor and a significant influence on her own writing. Also known for her short stories, Byatt has been influenced by Henry James and George Eliot as well as Emily Dickinson, T. S. Eliot, and Robert Browning, in merging realism and naturalism with fantasy. Her story collections include Sugar and Other Stories (1987); The Djinn in the Nightingale's Eye (1994), a collection of fairy tales; Elementals: Stories of Fire and Ice (1998); and Little Black Book of Stories (2003). The Matisse Stories (1993) features three pieces, each describing a painting by Henri Matisse, each the tale of an initially smaller crisis that shows the long-present unravelling in the protagonists' lives. Her books reflect a continuous interest in zoology, entomology, geology, and Darwinism among other repeated themes. Byatt has written for media including the British journal Prospect, The Guardian, The Times and The Times Literary Supplement. She has been a judge on many literary award panels including the Hawthornden Prize, the Booker, David Higham Prize for Fiction, and the Betty Trask Award. On the role of writing in her life, she says: "I think of writing simply in terms of pleasure. It's the most important thing in my life, making things. Much as I love my husband and my children, I love them only because I am the person who makes these things. I, who I am, is the person that has the project of making a thing. Well, that's putting it pompously – but constructing. I do see it in sort of three-dimensional structures. And because that person does that all the time, that person is able to love all these people." 1999 DBE "for services to Literature"
2007 Honorary degree from the University of Winchester. ^ The 50 greatest British writers since 1945, The Times; retrieved 10 January 2016. ^ a b c d e f g Leith, Sam (25 April 2009). "Writing in terms of pleasure". The Guardian. Retrieved 18 January 2015. ^ Gruber, Fiona (1 February 2014). "Blend life to thicken the plot". The Australian. Retrieved 18 January 2015. ^ a b c d e f g "Dame A. S. Byatt" British Council Literature. ^ Why Margaret Drabble is not A. S. Byatt's cup of tea. The Daily Telegraph, retrieved 22 September 2011. ^ A. S. Byatt (13 October 2003). "A Stone Woman". The New Yorker. ^ "No. 55513". The London Gazette (Supplement). 12 June 1999. p. 6. ^ "Britse schrijfster A.S. Byatt krijgt Erasmusprijs" (in Dutch). NOS. 17 January 2016. Retrieved 17 January 2016. ^ "Press release: Erasmus Prize 2016 awarded to A.S. Byatt". 2016-01-17. Retrieved 2016-01-17. ^ "A.S. Byatt to be awarded 2017 Park Kyong-ni Literature Prize". donga.com. September 28, 2017. Retrieved September 28, 2017. ^ Stephen Gadd (September 11, 2017). "AS Byatt scoops prestigious Danish literary prize". CPH Post. Retrieved September 12, 2017. Mundler, Helen E. “Time to murder and create? The Bible as intertext in A. S. Byatt’s Elementals: Stories of Fire and Ice”. FAAAM, no. 4, 2010: 65–77. Philip Hensher (Fall 2001). "A. S. Byatt, The Art of Fiction No. 168". Paris Review.